← Satisfaction….. Are you getting enough?? Class B fires – are fires involving flammable liquids. The different categories of fire require different types of fire extinguisher. Should be used for materials such as wood and paper. They MUST NOT be used on fires involving electrical equipment or oil. Should be used on fires involving burning liquids such as paint and asphalt. They MUST NOT be used on fires involving electrical equipment or flammable liquids. Are both normally used on burning liquids. They are safe for use on fires involving electrical equipment. Neither of these extinguishers have a cooling effect, consequently they are not recommended for use where there is a high risk of re-ignition. 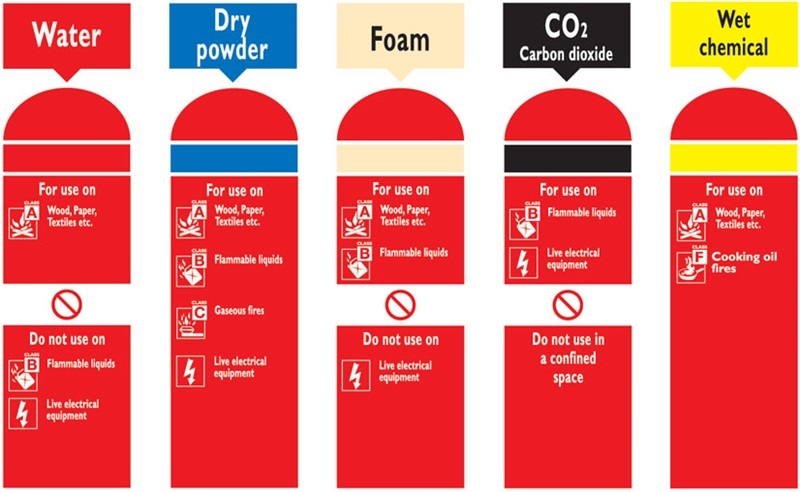 Use carbon dioxide extinguishers in well ventilated areas because they reduce the amount of oxygen in the air. Less Frequently seen, but possibly still in circulation. Can be used in most instances including use on electrical equipment. They are recommended for use in the open air or in well ventilated areas because of their toxic properties, so do not use in confined spaces. Because fire extinguishers cannot always be identified by their colour, do not use them without first reading the label. ! ! R E M E M B E R !! - Get everyone out as quickly as possible and call the fire brigade. - If the fire in its very early stages, and you feel confident to do so, attempt to extinguish it with the appropriate extinguisher. - Always ensure that you have a clear exit path available. - Fire spreads very quickly. Even a small, contained fire can quickly spread, producing smoke and fumes which can kill in seconds. - If you are in any doubt do not tackle the fire, no matter how small. You can put yourself at risk by fighting the fire. If in doubt, get out, stay out and call the Fire Service.